A carnival gypsy (Brett O’Hara) hypnotizes a teenager (Cash Flagg) and turns him into a killer zombie. Meanwhile, his girlfriend Angela (Sharon Walsh) and friend Harold (Atlas King) try to find out why Flagg is acting so strangely. This wackily-titled exploitation flick by low-budget director Ray Dennis Steckler (a.k.a. 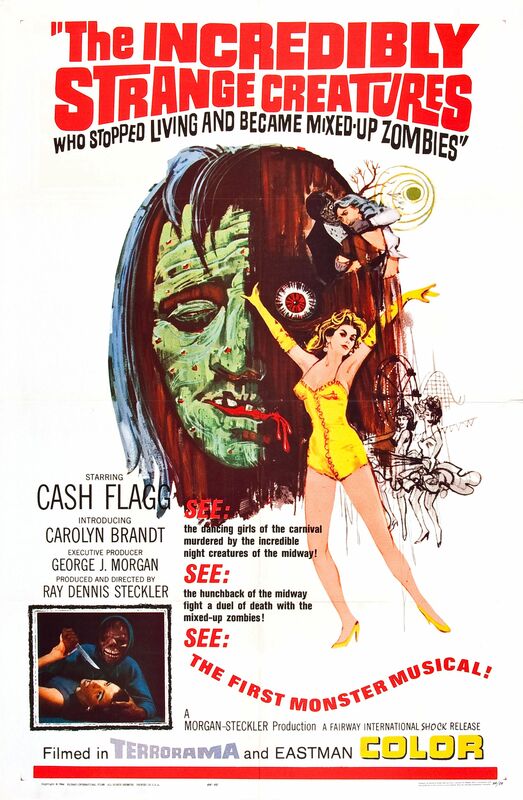 “Cash Flagg”) is one truly awful film: it’s got terrible acting, laughable costumes, a nonsensical storyline, and insufferable musical “interludes” which have nothing to do with the main plot. With that said, TISCWSLABMUZ/TSMBM (yes, that’s the title’s acronym!) is ripe for satire; if you do decide to check it out, rent the inspired MST3K (Mystery Science Theater 3000) version to make your viewing experience at least tolerable. No, though film fanatics may be curious to see one film by notorious cult director Steckler, and (if so) this one should probably be it. Some Ed Wood films are better than this. Yes, it’s inept. But not enjoyably so. Not even dopey-enough dialogue. Just a waste of time. And I’ve seen it with and without the help of MST3K. Speaking of which: occasionally, Mike Nelson and his robots have been truly inspired. I recall two winners: ‘Kitten With a Whip’ and ‘Girls Town’. Not that I’ve seen every episode but, generally, MST3K shows are spotty with zingers. There are a few real good ones as the guys watch this ‘film’, but I was a little remote-happy out of boredom.